Globe, 12 September 1910. Newspaper image © The British Library Board. All rights reserved. With thanks to The British Newspaper Archive (www.britishnewspaperarchive.co.uk). We have identified several origins of the Ruby name, in Denmark, Switzerland and England, with many families in France and Ireland, as yet with roots unidentified. However, as we saw from the case of Jack Ruby, there are other families called Ruby whose roots lie in Eastern Europe, so far as we have yet found, under other names. In Jack Ruby’s case it was Rubenstein, originally from Sokolow, near Warsaw, in Poland. In the case of another Ruby family in Boston, Massachusetts their original name was Rubinovitz and they hailed from Merkinė in modern day Lithuania. Another origin of a Ruby family was traced to a man in Limehouse, one of the most socially-deprived areas of inner London and home to much immigration for Jewish migrants escaping from Eastern Europe in the 1870s. Reuben Rottstein, a tailor, came from “Germany” and in one census identified his birthplace as Otelberg, which we believe to be Ortelsburg, now Szczytno in Eastern Poland. He appears to marry Ada Moor(e) (we haven’t found the ceremony) and had a dozen children. The first and third of them were born in Bristol in the West of England, but all the others were born and lived in Limehouse. The third child, Isaac, is the subject of this tale. We had found him in the 1911 census as Isaac Ruby. He had a wife and a baby son, though again we couldn’t find a marriage. We found four more male children, Isaac’s record in the 1939 register (three years older than what his age in 1911 would have indicated) We found his death record, but where was his birth? Looking for a child named Isaac, even one born in Bristol, was like looking for a needle in a haystack. However, given where he had lived and our experience with those other Ruby families made us think. If we listed all the Isaac births in the Bristol area, how many might have Eastern European names? Guess what! An Isaac Rothstein birth in 1887, but no Rothstein family. However, we found Isaac, Reuben, Ada and family in Limehouse in 1901 and then by looking for combinations of given names, found a Rottsten family (transcribed as Kattstonten in 1891!) and a Rottstein family in 1911. However, there were no Rubys! 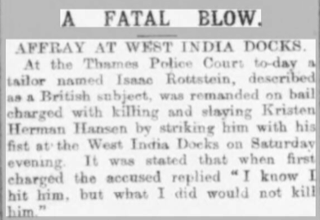 Then we happened upon a court case: in October 1910, an Isaac Rottstein was put on trial at the Old Bailey in London on a charge of Manslaughter. He had beaten up a Norwegian sailor in a dockland pub after said sailor had ogled two of the women who had been sitting with Isaac. Although Isaac had been in some trouble before, given the evidence to the court, which you can read in full here: https://www.oldbaileyonline.org/browse.jsp?div=t19101011-29 , he was found guilty but given only a two month sentence. Although it is not made plain in the transcript, two of the witnesses Elizabeth Dixon and Annie Dodd were mother and daughter, and the latter was to be the mother of Isaac’s children. It is not at all certain why Isaac changed his name, but he did, and he kept it, fathering five male children, two of whom went on to have children of their own. We wonder whether Isaac was pushed out of his family to save their good name. So far as we can tell, they all remained Rottsteins. There is one public tree at Ancestry.com from one of Isaac’s descendants, but it stops with him. If there had been significant contact the tree would surely have reflected it but it does not.